“I did quite a bit of research before joining onlineauction.com. I was looking for an auction site–not a fixed price site. OLA fit the bill. I thought then, and continue to believe, that OLA has great potential. I joined as a Founding Member–partly to get a store (called an OLA House), partly to lock in my fees for life, and partly to put my money where my mouth is. “I was a seller on ebay for over 8 years and I moved to http://www.onlineauction.com. It’s the best!. It’s like ebay used to be a long, long time ago and makes selling & buying online fun again. 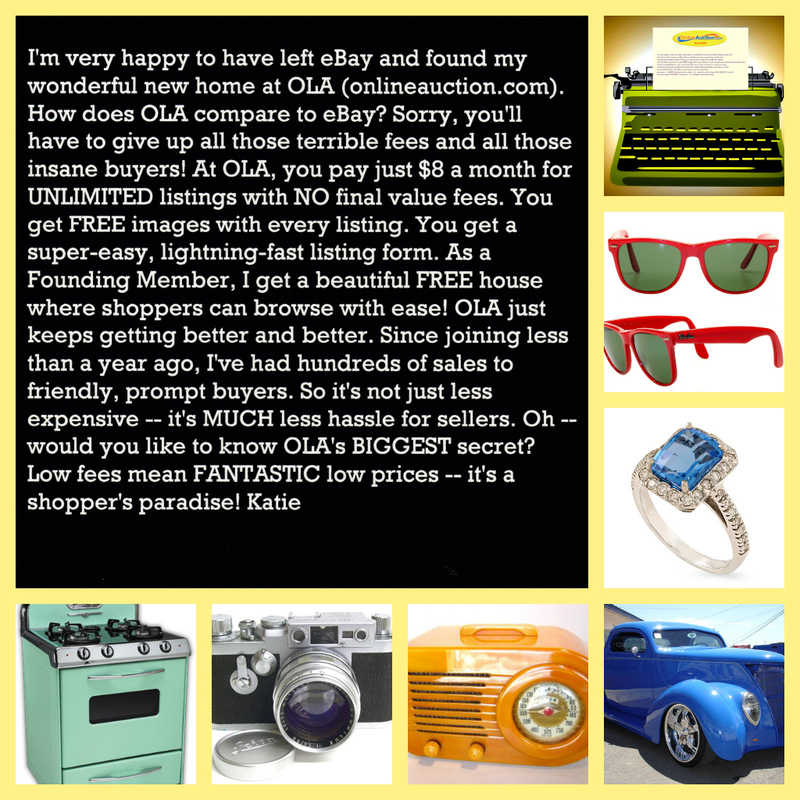 OLA is only 8 bucks a month, no matter how much you list! 0 final value fee, 0 relisting fee, 4 free pictures, freedom of the payment choices you as the seller, want to receive, not what some other site tells you what you must accept! Freedom to put a link in your listings, if you sell elsewhere. OLA gives you the freedom because they don’t collect a final value fee. It also has all the same auction formats as ebay does. I becoming a founding member because it locks in the 8 bucks a month fee for life. With OLA growing so fast, it’s a great bargain for the online seller. My sales are really picking up as so many ebay refugees are finding OLA and lovin’ it. I researched ALOT of other sites before choosing OLA. It’s the most like ebay (only better). All the other sites I checked out are too confusing and too messed up from a buyers point of view. OLA is plain & very easy. “Deb and I sold on the big E for almost 4 years and when the big change started back early this year we decided we needed a change. we ended up on OLA.COM and are very happy there. it is a no stress place to sell and the people are like family and we all help each other out, we work as one to build a great site for all of us. our sales have been picking up and we are very happy with the customer support and the other sellers. “I think with the decline of Ebay there are a lot of sellers looking for the best place to sell right now and every site has its merits and demerits. We were on Ebay for many years with over 3000 100% positive sales but like many others the management decisions and the fee increases drove us out the door…we tried a few sites while we were still there checking out the listing ease, the cost to us as sellers, site navigation and all the other things you look for when starting anew. I am not going to disrespect any site here as they are all mostly in their infancy but the only site that satisfied all the criteria we were looking for was onlineauction.com. We were welcomed by the sellers we met as friends rather than competitors, every question we had was answered quickly and efficiently by fellow sellers or staff, listings are an absolute breeze and the cost?…well $8.00 per month is just under 4 cents a day, 4 free pictures, no final value fees, different styles of auctions and good sales in our first month convinced us we had found what we were looking for!!! -Tamara “I sold on Ebay for many years but had to join the boycott (myspace.boycottebay) when ebay decided to ruin the small sellers. I wandered around the net looking for new venues and even sold a few more things on ebay because I thought I HAD to in order to make money. The result of going back to ebay was 4 NPB or Chargebacks out of 15 transactions! I figure I lost about $200 on that deal! Now I sell at onlineauction.com almost exclusively. They are set up to handle the most influx, they are easy to navigate, easy to list, easy to buy, and only 8 bucks a month to sell! NO final value fees! It’s FREE to buy too. The community at onlineauction is amazing and feels more like a “family”. I never spent much time on the ebay boards and when I did, they were so petty and mean! Everyone treated you like you were stupid if you had a question or concern, or they just tried to discourage you from selling. OLA is SO different! They welcome new sellers and buyers alike! They have contests with each other to see who can answer a new person’s question first! They pray for each other, help each other out, play games together, and even have auctions for EACH OTHER! Some of us have even begun LINKING our auctions to other sellers auctions… just to be nice! -Trixie “I can tell you with most certainty- that I DO NOT SELL ON EBAY. I used to sell on ebay-until Ebay joined the ranks of Corporate Greed. It is the fees that the sellers pay that enable the CEO’s,executives, and other members to recieve a salary. The Corporate Officers and CEO have gone to great lengths over the past few years… to find every possible way to entrap, discourage, disable and cheat the many many former loyal ,honest ,Hardworking Ebay sellers- of which Ebay has then set into motion -the most deceptive forms of practice and policy changes in early 2008-tieing the hands, and robbing the sellers to the point that even the Largest Businesses on ebay have left ebay for Good-and crushed the smaller ones. Prospective honest buyers no longer go to ebay as well. It has become a Haven or Sancutuary for internet theives. Personally- i started to buy things on a site called Ola. com. It’s user friendly-and it seems it is where all former ebay sellers have gone. So i too will be selling on Ola shortly-as my buying experiences there have been what EBAY WAS ONCE… BUT WILL NEVER BE AGAIN. “Ola.com” has a easy site name, a great variety of items, and is THE PLACE TO BE. ! Ola has been in business since 1998-but could never compete with ebay in the past… but Ola.com has had to make several upgrades to accomodate the newly incoming buyers and sellers. Hello Ola !!!!! And Ola has a toll free phone number of which anyone may be able to speak to a friendly staff member… a real Human… Ola’s staff is patient, most helpful, and they are extremely organized. -Karen “I left Ebay back in February when all the changes came out. I know sell on onlineauction.com which works for me. I have seen many improvements seen I joined them back in Feb. I also have items on ioffer with no success, but being there I have nothing to lose. I can tell you for certainty that I no longer buy or sell on ebay.